Novelist Shirshendu Mukhopadhyay is one of the greatest author at the modern time in Bengali literature world. He down his pen and created lot of stories for children and adult person. His first story was published in 1959 in Desh Patrika which titled 'Jaltaranga'. Seven years later, his first novel 'Ghun Poka' was published in the same magazine in Pujabarshiki. Here some list of his written books for adults- 'Goynar Baxo', 'Paymanta', 'Guhamanab', 'Kachher Manush', 'Jugolbandhi', 'Drishyabali', 'Kapurush', 'Kancher Manush', 'Criyabhumi', 'Tirondaj', 'Chakra', 'Jao Pakhi', 'Borosaheb', 'Naronari Kotha', 'Shyaola', 'Jhanpi', 'Charidik', ''Rangin Sanko'', 'Hatbar', 'Warish', 'Khudkure', 'Sukher Arale', 'Sampatti', 'Madhur Jonyo', 'Pipul' etc. And for children- 'Raghav Babur Bari', 'Patalghar', 'Boni', 'Bhuture Ghari', 'Gojanoner Kouto', 'Hirer Angti', 'Sadhu Babar Lathi', 'Hetomgorer Guptodhon', 'Golmele Lok', etc. Now I want to share another best creation of his 'Ganjer Manush' in pdf. There are nineteen short stories in this book, these are- 'Ektukhani Benche Thaka', 'Ganjer Manush', 'Ukiler Chithi', 'Ghantadhwani', 'Harano Jinis', 'Larai', 'Masha', 'Ekta Duto Biral', 'Bagh', 'Khanatallas', 'Cricket', 'Vela', 'Chiriyakhana', 'Shuklapokha', 'Haoya-Banduk', 'Khabarer Kagaj', 'Tritiyopokha', 'Ichchhe' and 'Punashch'. 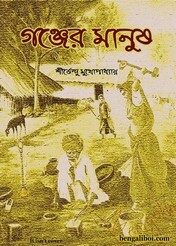 Collect the Bangla Galper Boi as pdf download- 'Ganjer Manush by Shirshendu Mukhopadhyay'.